Today we woke up in Marina Cay. For breakfast we had french toast while feeding the seagulls. Our staff Kat, Liz, and Eli went to a staff meeting, so we had music party on the boat while relaxing on deck. 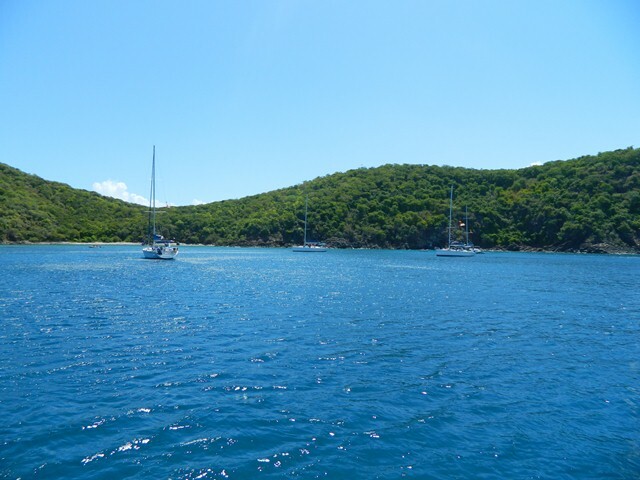 Once Kat, Liz, and Eli returned from the meeting, we got our two anchors out and sailed to the Dogs and snorkeled and went scuba diving at the Chimneys. While we were sailing Jacques fell asleep in the cockpit, rolled over onto the winch handle, and did not wake up! Everyone on the boat was laughing. Eventually Jacques woke up from his deep sleep very confused where he was. We all told him what happened, and he also laughed. Once we got to the Dogs we had a sail chat with Kat. She talked about navigation names review, and more about navigation. After our sail chat we went scuba diving with Liz. We dove about 40 feet today and then sailed to another area to anchor our boat. However, before we left, we watched Laurasia get pranked by another boat. The staff attached a small Pico sail to Liam’s halyard. When he tried to raise his sail, a tiny sail was hoisted up in the air. Everyone laughed so much. Watching Liam hoist his “sail” up was definitely the best part of the day.